Trekking poles also known as walking sticks or hiking poles are standard equipment for many walkers, hikers, trekkers, backpackers and snowshoers. The reasons why are simple: They enhance your stability and provide support on all types of terrain. 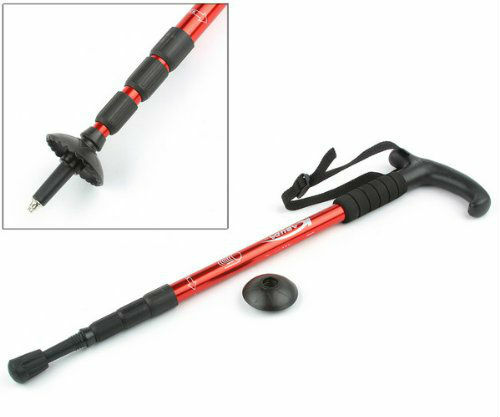 This is great but many users do not know how to adjust the height of their trekking poles. The best height for walking poles varies from user to user and is often down to personal preference. Always make sure you adjust the height of the poles to suit you! Not everyone is the same, regardless if you are the same height! Adjust the poles so that your arms are at a 90-degree angle, depending on the terrain you are on. Match the corresponding number to your height and lock the pole at the correct marks on the pole ruler. These numbers are just suggestions, but the most important part is to make sure your elbow is at a 90-degree angle. Generally speaking walking poles should be the height from the top of your palm (when your arm is down by your side) with your forearm held out in front of you at 90 degrees to your body. Essentially the top of the handle should be at waist/hip level and your elbow at 90 degrees. If you have particularly long legs for your height you may find the height from the tip of your upturned thumb more comfortable and better matched to the length of your stride. Those with shorter legs might like to use the height from the bottom of your palm more suited. Get your height in centimeters (cm). It must be in centimeters or this won’t work. You can always use the Google conversion or this site to get the correct number. The resulting number, which will be in cm, will be exactly how long in cm the poles should be for you. 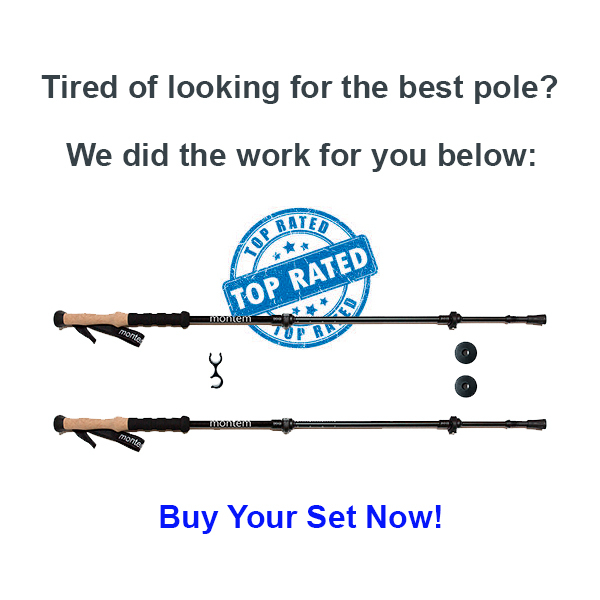 Adjust your pole to this height! Now you know your exact pole height and your height in cm! Uphill: 5-10 cm shorter, depending on steepness and inclination as you are trying to increase the load bearing pressure. If they are too long you might also find that you are overstretching when try to plant them. 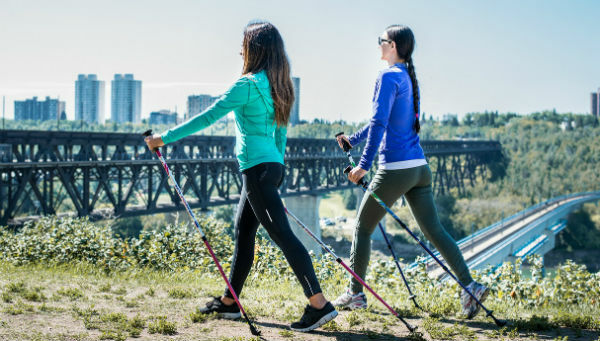 Downhill: 5-10 cm longer, depending on steepness and inclination as you are trying not to stretch out too much when placing the poles, which will help improve balance. When traveling downhill the poles will take some of the strain off your knees. As a reminder, always buy two poles , one for each arm. And, make sure that your poles aren’t completely extended while walking on flat ground. You want some length left in reserve so that you can extend the poles for added reach on the downhills. The object is to shorten the poles on climbs, and then extend them for the descents. You should rest somewhere in the middle on flat/slightly undulating terrain. 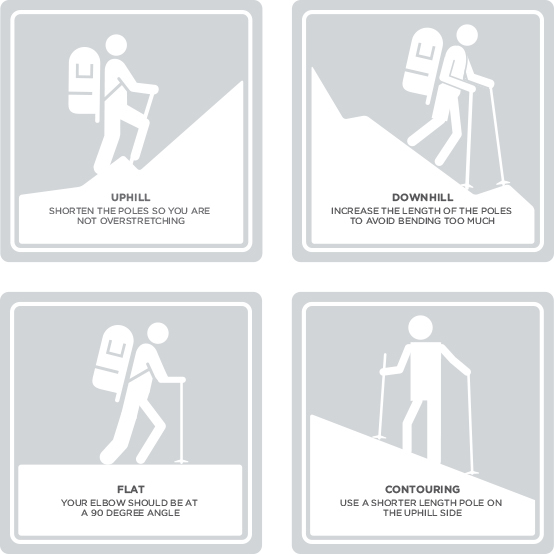 Remember that the heights of your trekking poles will vary from person to person (even if you are the same height) and from terrain to terrain.